For over 70 years, Faber & Kell's has been the definitive reference text in its field. 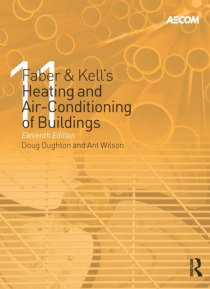 It provides an understanding of the principles of heating and air-conditioning of buildings in a concise manner, illustrating practical information with simple, easy-to-use diagrams, now in full-colour.This new-look 11th edition has been re-organised for ease of use and includes fully updated chapters on sustain… ability and renewable energy sources, as well as information on the new Building Regulations Parts F and L. As well as extensive updates to regulations and codes, it now includes an introduction that explains the role of the building services engineer in the construction process. Its coverage of design calculations, advice on using the latest technologies, building management systems, operation and maintenance makes this an essential reference for all building services professionals.